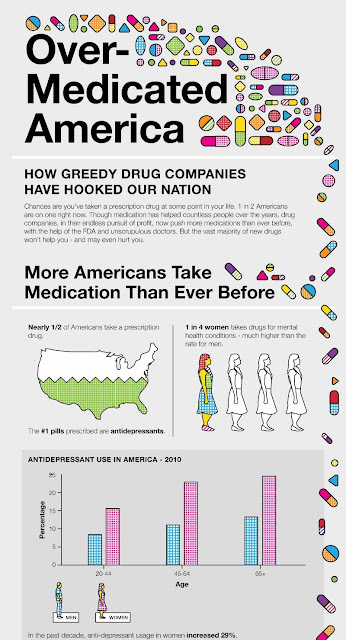 There is a prevailing notion that the Western world, in particular USA, is over-medicated and over-diagnosed. There is also a prevailing notion the the Pharma industry is almost completely void of public trust. The patent cliff may have encouraged dubious antics on the part of pharma conglomerates, but it would be safe to presume that consumer trust in the industry has begun to decline significantly earlier. It has been suggested that pay-for-delay cases alone have cost the consumer nearly US$ 3.5 billion annually, and such agreements are alarmingly on the rise, despite being illegal. Extrapolating from the same principle, a recurring conundrum becomes evident: how much of the high drug cost would be accepted and justified by patients, and how much of this cost is compensating for activities which consumers are blatantly against? Some examples of such practices are evergreening and pay-for-delay practices, coercion of doctors, ghost writing, in particular with the aim of “medicalizing” conditions, endless clinical trials of the same compound for a variety of indications, and the list goes on. It is a fact that the number of officially recognized disorders is soaring in the world, despite there being no obvious novel symptoms, and patients are increasingly becoming uneasy about medical practice as a whole. For instance, GSK’s new smoking cessation drug, Zyban, is nothing more than a long-acting form of its anti-depressant Wellbutrin, whilst its anti-depressant, Zispin, is also being marketed for sleeping disorders, which happen to be one of the primary symptoms of depression. Understandably, in an industry which is slowly transforming from a "pull" to a "push" market, expanding the target customer base by blurring prescription lines can be a powerful business strategy, in particular at times when companies are desperately dashing around for short-term revenue boosts. To present it straight from the horse’s mouth, Barry Brand, the product director of Paxil at GSK, declared in a recent interview, “Every marketer's dream is to find an unidentified or unknown market and develop it. That's what we were able to do with social anxiety disorder." As companies are currently fishing around for novel business strategies, medicalization or analogous practices may become a legitimate item on multinationals’ agendas, and can be particularly applicable in emerging markets where the sphere of social disorders still comprises massive potential. Emergence of medicalized ailments for the most part takes place through medical journals, whose primary target audience are doctors and nurses. In a widely publicized case, research conducted by pharma journalist Ray Moynihan led to the conclusion that expert-industry links are not hard to find. For instance, a study published in the Journal of the American Medical Association on female sexual dysfunction (FSD), a relatively novel medical phenomenon, found that 43% of women were FSD sufferers. Incidentally, the authors of the study were found by Moynihan to have close links to Pfizer, which was conducting clinical trials of “Viagra for women” at the time. Tales of a similar nature are ubiquitous, but perhaps the system is to blame as much as Big Pharma for lack of transparency. Pharma-sceptics argue that a regulatory system as part of which corporations are allowed to come in direct contact with and to essentially coerce medical professionals entices corruption at the least. Appointment of accountable government-approved entities, such as those in operation in Europe, would invariably benefit patients in this medicalized day and age. In some developing economies, however, it may take decades before governments are able to adopt systems of this sort. The “placebo effect” is an emerging phenomenon promising to be a worthier challenger to the pharmaceutical industry than many other threats. The miraculous ability to self-heal, powered purely by the human body’s will to live (animals have not been found to respond to placebo), has been a well-documented occurrence for some time, but only recently has the potential of the placebo seriously attracted the attention of scientists and medical practitioners. The effect used to be nothing more than a nuisance attributed to gullibility and neurosis in patients, but the emergence of neurological proof of its action finally put this phenomenon on scientific agendas. Acupuncture, Reiki, and similar practices bear testimony to Placebo’s power, but, ironically, so does the pharmaceutical industry itself. 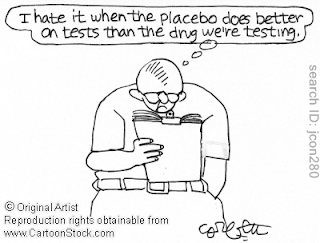 An overwhelming number of clinical trials, in particular trials which are conducted with the use of questionnaires, have failed because placebo pills were shown to be more than, or at least as effective as, the drugs being tested. That is to say, the compounds in trials were able to improve the patients’ conditions, only the placebo improved them more. Even in the case of previously approved CNS drugs, such as anti-psychotics and anti-depressants, the compounds’ effectiveness over placebo is sometimes so insignificant that companies would have a hard time bringing them to market in the current regulatory environment. This applies even to blockbusters, such as Prozac, which has performed rather poorly against sugar pills in recent follow-up trials. Pfizer’s "female Viagra" and Amgen’s Parkinson’s disease drug have also fallen victims to the Placebo Effect in recent years, sparking much-needed debate about deepening our understanding of the body’s innate ability to heal itself. Probably a little to pharma’s dislike, progress is being made in the sphere: Harvard Medical School recently initiated a new program in placebo studies, headed by placebo guru Ted Kaptchuk. The program has conducted a number of breakthrough studies to date, including curing cases ranging from chronic bronchitis to stomach ulcers. As the cellular and molecular pathways of placebo action are en route to becoming elucidated, therapy of the mind is likely to gain more traction in modern medicine. Various forms of hypnotherapy are already being approved by the NHS in the UK, and governments are certainly eager to explore alternatives to drugs in light of pharma’s reputation. In addition, clinical trials previously conducted by pharmaceutical companies could hold a wealth of information useful for placebo studies, but this is unlikely to ever see the light of day. Perhaps the biggest threat of the placebo effect to pharma is its role in the media and society: the issue is becoming widely publicized and bears the message “drugs don’t work”, or at least not as well as the brain. Up until now, even despite bad reputation, pharma stayed afloat because everybody conventionally needed drugs, but the placebo effect happened to be one of the proofs presented to patients that medication is in fact something they can occasionally do without. And so much effort was spent by companies on building relationships with doctors and insurers, that they have seemingly neglected or simply ignored their public perception. Thus, in a rapidly shifting pharma environment, especially where out-of-pocket payers will shortly constitute a huge portion of pharma’s customers, it is imperative that multinationals begin to take their public image seriously. Documented cases of Big Pharma misconduct have been on a frightening rise in recent months. Both Roche and Novartis were accused of under-reporting and concealing side effect data of several of their drugs, whilst a number of other companies were accused by governments of the developing world of severe over-pricing (the Indian government recently revoked Roche's patent for the company's Hepatitis C drug Pegasys due to its extortionate cost). In the West, scepticism in the pharmaceutical industry has reached of point where patients have begun to develop a habit of reflexively looking for non-pharmaceutical alternatives as therapy for non-life-threatening ailments. Studies into the Placebo effect may have negligible repercussions on the industry at this point, due to a general lack of knowledge and faith in "Placebo practices". But the sheer fact that alternative therapies for many blockbuster disorders have been proven feasible and effective renders this practice a potentially very powerful pharma competitor. At the moment, Big Pharma's interest in developed markets may have waned, and it has subsequently lost interest in maintaining an immaculate public image, amidst a frantic gold rush for pharmerging shores. Markets such as China, India and Brazil may still lack the public awareness of this industry, and are likely to look much more favourably upon the business of saving lives. For the time being, to maintain its success, pharma is merely changing its location, rather than changing its conduct. But as Einstein's famous quote goes, "Insanity is doing the same thing over and over again and expecting a different result"; the industry is in dire need of a new modus operandi. If drugs can no longer effectively and safely reach the market without concealed data and unlawful acts, the industry can only anticipate an inevitably unanimous public reaction globally. And, unfortunately for pharma, effective alternatives to medicine are beginning to emerge and to slowly win over the public. Above was an excerpt from Bioassociate's white paper, "The significance and apparent repercussions of the 2009-2015 pharmaceutical patent cliff", the full version of which can be downloaded here.